Have you seen the previews for the new horror movie that just opened called Ouija? It looks quite silly, but the previews were enough to bring back memories of something I'd long forgotten: the sheer terror with which some evangelical fundamentalist Christians regard the Ouija board. And with Jesus Ween right around the corner, I thought this would be an appropriate time to share some thoughts on this subject. Before the age of 14, I'd never heard of Ouija boards. That would change when a friend showed up to a party with one. I believe his goal was to see if he could freak anyone out with it, and he certainly succeeded. But everyone present that night was freaked out in a fun way. Nobody was upset; fun was had by all. I was already something of a skeptic at this point in my life, and I certainly did not believe that we were actually communicating with "spirits" or anything of the sort. But I seemed to be in the minority here. Most of the others who either participated or observed took the idea of disembodied beings communicating with us at least somewhat seriously. Some really seemed to believe it wholeheartedly; others were probably just going along out of curiosity. I suppose the poor "souls" with whom we were communicating had little to do besides creep out drunk kids while they awaited their final destination. I would learn approximately half of the lore surrounding the Ouija board on this night. What was explained to me was that we are always surrounded by the "spirits" of the deceased, but we have no way to communicate with them or they with us, except for particular tools like the Ouija board. By using it, we could ask them questions, and they could answer. There were veiled mentions of the possibility that some of the "spirits" we might contact were not benign, but this was not something anybody wanted to dwell on. I didn't realize at the time that this was only half the story. Over the next year or two, it was not uncommon for someone to produce an Ouija board and parties. It seemed like a good way for some people to freak each other out. I'd have a few experiences with it that seemed a bit creepy at the time. It was during this period that I'd learn the rest of what some people believed about it. After a couple of evangelical fundamentalist Christians I didn't know very well burst into tears and left at the sight of it, I would become curious and soon discover what they and others at their church had been taught about the Ouija board. 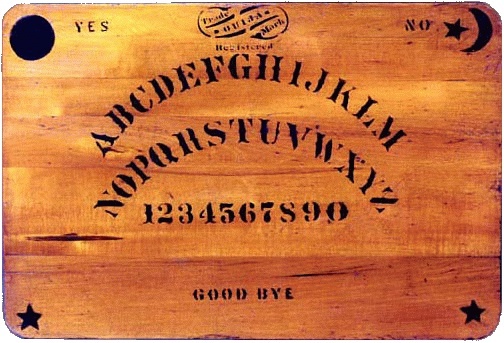 For these evangelical fundamentalist Christians, their families, and others at their church, the Ouija board was nothing short of a Satanic instrument. Yes, we were surrounded by "spirits," but many were evil. Some were demons who sought to possess us. The Ouija board was a conduit from their world into ours, and it could even lead them directly into us. Messing with an Ouija board was extremely dangerous, a form of "black magic" that almost guaranteed one would end up possessed by demons. These beliefs probably seem familiar to you. They are familiar to me today. I've known many Christians who shared them, and I've seen them depicted in countless horror films. But this was the first time I encountered them. I was suspicious that someone was messing with me. Nobody could really believe this, could they? I'd soon learn just how seriously some evangelical fundamentalist Christians took this sort of thing and what they were willing to do to their own children because of these beliefs. And I'd encounter many more real-life horror stories of evangelical fundamentalist families and churches terrorizing their children with this sort of nonsense. Within another year, I'd realize that Ouija boards weren't the half of it. They were just one of a long series of things that terrified many evangelical fundamentalist Christians. Other examples included the music their children liked (especially heavy metal), yoga, meditation, atheism, and practically everything associated with New Age or Eastern beliefs. These Christians believed that a literal war between angels and demons was taking place around them. Their "souls" and those of their children were in constant danger from the demonic. What an incredibly strange way to live one's life! Hasbro is selling an updated version of their Ouija Board Game , but some of the reviewers at Amazon.com complain that it doesn't work. So sad.